Nineteen percent of motorcycle riders in the United States are now women, according to the annual survey by the Motorcycle Industry Council. My own experience, and all the women riders, instructors and entrepreneurs I've met, back up that statistic. Since 2009, our numbers have nearly doubled from 10 percent to 19 percent. I guess all those secret messages that me and my women riding friends have been sending to other women have been working! Events like Babes Ride Out are building ties among women riders and encouraging the next generation. Photo by Alessandra Sarmiento. Working in the motorcycle industry for the past decade, I’ve had more women contacting me for help with riding gear and learning to ride. But that's not all women are doing. More importantly, many of us have decided to take matters into our own hands by starting our own motorcycle resources or businesses. Brands like GoGoGear, Stellar Moto Brand, Curvy Riderz and Worse For Wear were all started by female entrepreneurs seeking to provide better apparel options for women. RevZilla has also seen its share of growth in the women’s apparel market, as well. Overall sales of women’s street gear have increased 67.1 percent since 2014 and the women's dirt apparel sales have grown, too. Women entrepreneurs in motorcycling are offering more tours and training. Photo by Lance Oliver. But it doesn’t end with riding gear. There are more nationally recognized women's motorcycle events across the country, too. Back when I started riding in 2003, the only women’s specific riding event I knew about was the Women’s Sportbike Rally, which started in 2006. Events like Babes Ride Out and ADVWoman Rendezvous have attracted women riders from all over the country to jump on two wheels and go meet up with other women who share the same passions. When you’re in the minority of a male-dominated activity, it can be a lonely experience. These events were created to provide options for like-minded female riders to seek each other out and hopefully learn from each other, as well. About 200 men and women (mostly women) participated in the final leg into San Francisco of the Sisters Centennial Ride. Photo by Joanne Donn. Another way women riders are finding each other is through motorcycle tours. Alisa Clickenger of Women’s Motorcycle Tours not only produced the Sisters Centennial Ride in 2016, but also offers year-round tours around the United States with the motto “For Women, By Women.” She’s not the only one. 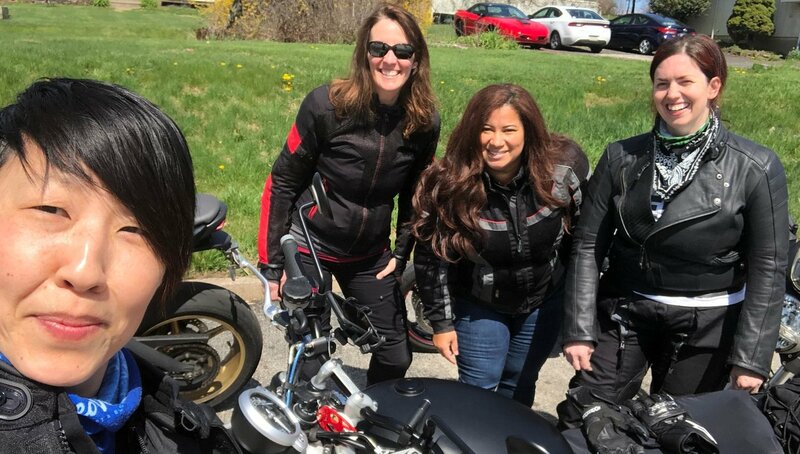 You can find other women hosting motorcycle tours, as well, including Pat Jacques of ADVWoman and Karen Thomson of Avid Moto Tours. And it doesn’t end there. More women are seeking out intermediate and advanced training courses to further expand their riding knowledge, like myself. Back in 2011, I attended my first women-specific track day with Z2 Track Days in California. But now you can find women-only track days all over the country, including Femmewalla, an annual track day event in Southern California that caters to women who want training and guidance on the racetrack. There’s also Ruts2Racelines in North Carolina. Earlier this year, I participated in the first women-only track day with Reg Pridmore’s CLASS Motorcycle School. Joanne Donn and Brittany Morrow at the all-women CLASS school. Photo by Joanne Donn. But wait, there’s more! Bonnie and Andrea have been running Coach2Ride, teaching everyone of all ages to ride dirt bikes in Southern California. Pat Jacques of ADVWoman also offers coaching, in addition to her Backcountry Discovery Tours. My friend Aleksandra opened Moto Guild San Francisco with her husband in 2011, a DIY community motorcycle garage offering maintenance workshops and station rentals. 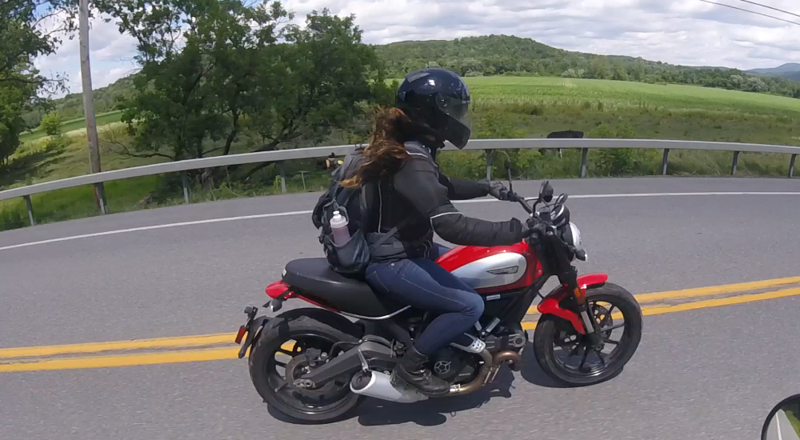 In New York, Motogrrl is another community garage offering similar services on the East Coast. There are far more resources than I can fit here. Women are getting geared up, learning to ride, maintaining our bikes and traveling the world. We’re riding, racing, wrenching and more. Help us, support us, join us.